As of 12/12/18, the racing clinic is full, but slots are still available for ski-only and non-ski participants. Have you ever wanted to run a few gates just for fun, but got chased out of the course by the ski patrol? Or thought about signing up for a NASTAR race but were worried about embarrassing yourself or crashing out? Well, here’s your chance to get up to speed with fellow PSCers in a friendly, no-pressure ski racing clinic designed for first-time and beginning racers. We’ll start off learning basic techniques of ski racing and finish up with a few timed runs on an easy-to-moderate race course set up just for us. In between, we’ll get in some skiing on Bryce’s small but diverse collection of ski runs. 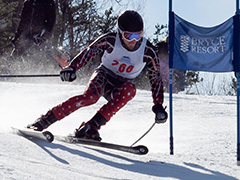 Discounts are available for non-racers, non-skiers, and racers/skiers age 70+. Participants are responsible for their own transportation and meals. Minimum of 6 racers required. For additional details, see the Bryce 2019 trip flyer. You must be a member of the Peninsula Ski Club to sign up for this trip. Prices are estimated and subject to change. Please make additional selections below for racing clinic and lift tickets. Includes instruction on basic racing techniques and an intramural ski race. Racers must also select a lift ticket option. Seniors age 70 and over ski for free.